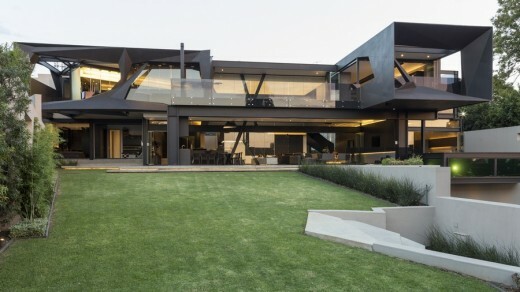 Located at the foot of a nature reserve in Bedfordview, Johannesburg, this luxury South African house is the latest project by Nico van der Meulen Architects. Between the use of transparent glass, a koi pond and pool surrounding the living room area, and the porch forming part of the interior-this masterpiece invites the serenity of the outdoor environment. Not only does the open plan of the entire house make it a practical and comfortable space to live in, but it also creates unity between all its different spaces, as each room subtly transforms into another as occupants move through it. 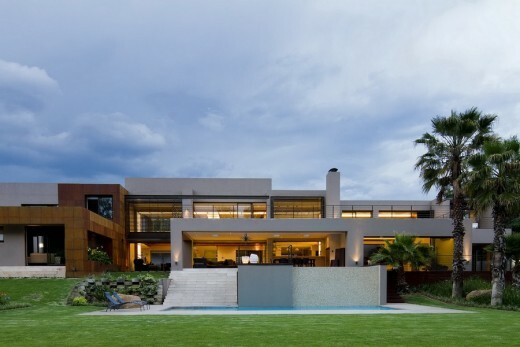 This residence in a leafy Johannesburg suburb was designed by Nico van der Meulen, founder of Nico van der Meulen Architects in 1986, on a 2000 sqm sub-division and completed in 1987 for his family, but also to use as his studio, as at that time he just started his own practice and decided to work from his home, specializing in the design of up-market residences. This 1960’s home, located in a prime area in a quiet cul-de sac of Johannesburg has been completely renovated. The glass wall between the living areas and the lanai folds completely away to create one huge living space, with the second lounge area leading onto the garden, and the dining opening onto the moat. Another luxury contemporary South African house by this architecture practice: as a result of an impeccable renovation, the house is divided into public and private spaces. To enter the private areas of the home, one must cross a bridge above a new internal water feature which breaks the public and private spaces, separating the entrance hall and study from the private home. 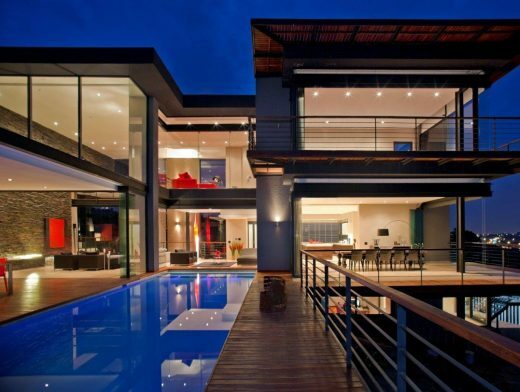 This is a Johannesburg home, located on a suburban golf estate, in Africa. The home’s visual success is due to its perfectly balanced application of earthy textures against high-gloss finishes, and raw material against refined elements. The house is situated on a 4000 sq.m site, with a total floor area of 2,500 sqm. An existing house was demolished to construct the new house. The owner requested a modern, glamorous, open plan, light-filled house with views from all rooms into the garden. The shape on the south side is a half circle, forming a horseshoe on the north side. Approaching the house form the gate the driveway is elevated to allow glimpses thru’ the house to the garden and raised water feature on the other side of the house. This villa was designed by Rudolph van der Meulen of Nico van der Meulen Architects for a mature couple on a 10,000 sqm parcel of land on a northern slope overlooking a private game reserve (see the telescope in the main bedroom!). The total covered area is nearly 900 sq.m. October 11, 2015 in Architects.